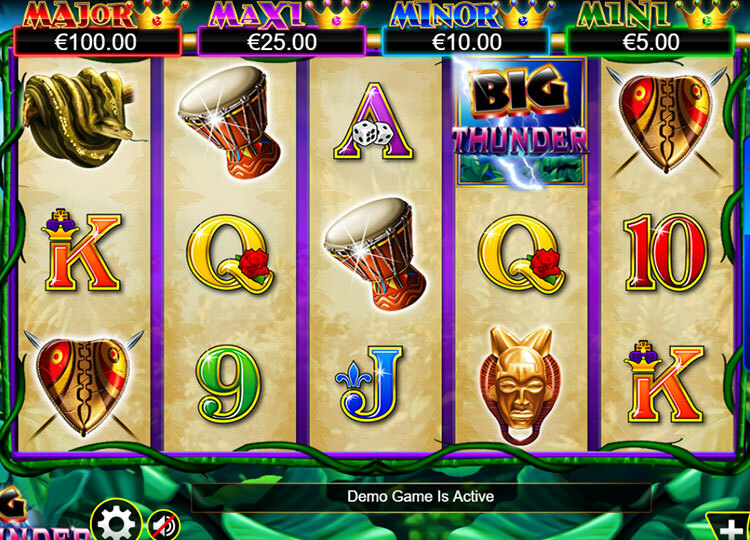 A spectacular game released by Ainsworth Gaming, featuring the majestic jungle vibes, Big Thunder is a very popular pick of the slot gamers online. The game has a beautiful backdrop of a jungle with every bit of it representing the wild animals and the wilderness of course. 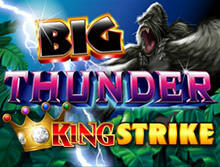 The entire name of the game is Big Thunder King Strike. With outstanding compatibility with the devices and eye-catching features, the game offers a slot of 5 reels along with a total of almost 30 paylines. It has a very straight and simple layout that makes it an easily playable game for the players. Along the reels can be seen the beautiful green vine which is curled up in them. The game has a lot to offer to its players in terms of bonuses and free spins. Adhering to the theme of the game, the symbols include all the amazing wild animals and other objects representing the jungle. All of the symbols carry different values. On a whole, they are divided into two major categories, namely, the high paying values and the low paying values. The former ones include a huge python, an indigenous colorful shield, a devilish mask, a drum giving you the tribal feels, a shiny royal golden crown, and a beautiful waterfall representing the natural habitat of the jungle. The latter symbols are simple card values including the numerical 9 and 10 along with three face values, J, Q, K, and A. These have low values assigned with them. There’s a wild symbol too. It is represented by a huge wild gorilla with WILD written in bolds on it. The function of the wild is to act as the substitute for the rest of the symbols except the scatter symbol. The Big Thunder icon that pops up on the reel is the scatter symbol which helps in triggering the free spins bonus. Thus, the symbols are attractive but very easy to memorize and understand. They make the game all the way more interesting and attractive by adding more of the jungle ambiance to it. The first and a very easily triggered bonus feature is the free spins. These can be easily attained with the appearance of the scatter symbol on the reels of the game screen. If three or more than three Big Thunder symbols appear on your screen, you will get a total of 15 free spins to play with. If three more scatter symbols pop up in these 15 spins, you get extra 5 spins to play. Getting the extra 5 free spins is very easy as, during the free spins, the wild symbol can act as a substitute for the scatter symbol too. A sixth reel will pop up in this too. It can either land up horizontally or even vertically. Depending upon that, you can avail a 3x win or even a 5x win. Not just this, your pay isn’t limited to initiate through the end reels only, instead, it can be both ways i.e., from right to left or vice versa. Mini Prize: In order to win the mini prize, you have to land up with 5 symbols having low values falling under a winning combination along with wilds and the golden crown appearing on the sixth reel. Minor Prize: To avail this, 5 high-value symbols in winning combination plus a wild and a golden crown should be present on the sixth reel. Maxi Prize: Five low-value symbols are to be present on the reels making a winning combination in order to avail this prize. No wild symbol or the crown symbol should be spotted on the sixth reel. Major Prize: Five symbols holding high value under a winning combination plus zero wilds and zero crowns on the sixth reel is what is required to win this jackpot. The game is definitely entertaining and worth playing. It offers interesting bonuses to the players and the overall appearance plus the conduct of the game pleases the player. Hence, it is surely recommended for playing.